At OCKT Limited our priority is to protect, respect and recognise the importance of your privacy. 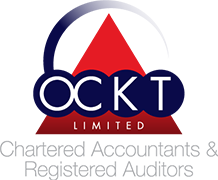 OCKT Limited is a firm of Chartered Accountants & Tax Advisors located at Glebe House, Glebe Place, Killarney, Co Kerry. We use specific actions on our website to collect personal information. We collect details when you get in touch with us about our services by using our contact forms, or when you register on our site to download leaflets, guides and other resources. The personal details we are most likely to collect are your name and email address. It is within your rights to ask OCKT Limited for your own copy of the details we hold on you. You can get hold of us to edit, adjust or delete this information. OCKT Chartered Accountants fully respects your right to privacy, and will not collect or publish any personal information about you through this website without your clear permission. Any personal information which you volunteer to OCKT Chartered Accountants will be treated with the highest standards of security and confidentiality, strictly in accordance with the Data Protection Acts, 1988 - 2003. OCKT Chartered Accountants does not collect any personal data about you on this website, apart from information which you volunteer (for example by e-mailing us, by using our online feedback form or by making a credit card booking). Any information which you provide in this way is not made available to any third parties, and is used by the OCKT Chartered Accountants only in line with the purpose for which you provided it. OCKT Chartered Accountants will make no attempt to identify individual visitors, or to associate the technical details listed above with any individual. It is the policy of the OCKT Chartered Accountants never to disclose such technical information in respect of individual website visitors to any third party (apart from our internet service provider, which records such data on our behalf and which is bound by confidentiality provisions in this regard), unless obliged to disclose such information by law. The technical information will be used only by the OCKT Chartered Accountants, and only for statistical and other administrative purposes. You should note that technical details, which we cannot associate with any identifiable individual, do not constitute "personal data" for the purposes of the Data Protection Acts, 1988 – 2003. If you are concerned about how personal data is processed via this website, please do not hesitate to bring such concerns to the OCKT Chartered Accountants by contacting us using the appropriate details on our Contact Us page.